In the busy construction world of project deadlines, client meetings, site visits, and project planning, it’s easy to take the tools we use every day for granted. Sometimes we overlook that one thing that could help save hours of work. Here are some tips and tricks for you that can help save you time, enable a new workflow, or maybe prevent a couple new gray hairs from cropping up. You can import 2D DWF documents into Autodesk® Navisworks® and use the 2D quantification tools to generate accurate quantities for the resources that are required on your projects. You now have integrated 2D and 3D quantification for your multi-format project datasets! Use the Project Browser | Import Sheet & Models. From inside Autodesk AutoCAD® 2015, you can use the Navisworks Navigator. Here’s how to do it: From the command line, type NWNAVIGATOR, and the Navigator Palette Window will open. From there you can do a walk- or fly-through, send views to AutoCAD, or get views from AutoCAD. With the Navisworks Navigator, you can explore the drawings and models that you are building. With Navisworks Freedom, anyone can view Navisworks NWD models for free. Navisworks Freedom includes a full set of navigation tools, including Walk, Look Around, Fly, and Zoom. Users can access viewpoints, animations, redlines, and comments. 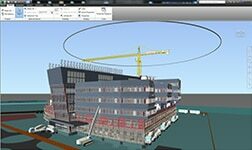 NWD files viewed with Navisworks Freedom give stakeholders equal access to explore and experience whole projects. Did you know that you can view Navisworks files saved as NWD on an iPad? 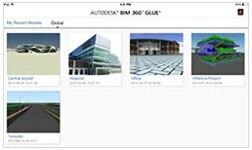 To view Navisworks files on a mobile device, use the BIM 360 Glue mobile app. You can view BIM 360 Glue project files, transfer .NWD files directly to the app, and use it whether you are online or offline. Did you know you can create Navisworks cache files automatically overnight? It will help save you time every morning! You can automatically create an NWD every week to give the project team a snapshot of the project status. Make sure you run Navisworks as an Administrator and run the Batch Utility; you can then set up your automated tasks using the Windows Task Scheduler. A project schedule stored in Microsoft Project can be integrated with Autodesk Navisworks to create a Timeliner 4D simulation of the project. With a model-based approach, you can connect scheduling tools that are critical to work execution and tie those tools to visual information contained in a 3D model. Did you know you can add 2D PDF sheets with Autodesk Navisworks 2015 PDF reader? One of the formats many of you receive day in and day out is PDF, and 2D is still widely used. Thanks to another little-know thing called the Navisworks App Store, you can download a free plugin for Autodesk Navisworks Manage 2015 and Simulate 2015 (for Subscription customers) that lets you add 2D PDF sheets to your Navisworks project. Autodesk Navisworks PDF reader helps you add these 2D sheets directly to your Navisworks project. 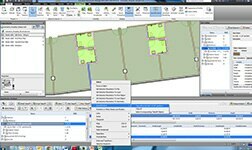 This means you can take off quantities and review your project not only in 3D but now also using 2D sheets. And Navisworks brings it together in a single project environment. Navisworks 2015 also supports 3D laser-scanned images. 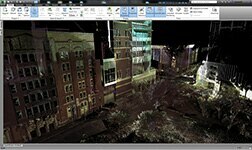 You can import laser-scan images and use them for existing construction, historic preservation, site visualization, progress tracking, and more. Try the Appearance Profiler. 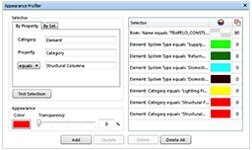 The Appearance Profiler allows you to set up custom appearance profiles based on sets (search and selection) and property values, and use the profiles to color-code objects in the model to differentiate system types and visually identify their status. Appearance profiles can be saved as DAT files and shared between other Autodesk Navisworks users. Clash Detective—all found clashes are shown in the Results tab in a multicolumn table. You can click on any of the column headings to sort the table using that column's data. 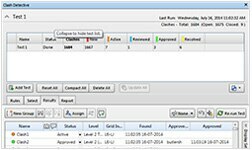 This sorting can be alphabetical, numerical, date-related, or, for the Status column, in workflow order: New, Active, Reviewed, Approved, and Resolved. You can see the status of your clashes by the color code, and you can review and manage your clashes between New, Active, Reviewed, Approved, and Resolved. We hope you find these tips for Autodesk Navisworks useful. 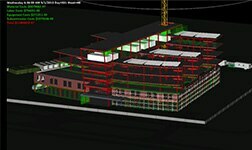 For more information on Autodesk Navisworks and its capabilities, please visit https://www.autodesk.com/products/autodesk-navisworks-family/overview today. Autodesk, the Autodesk logo, AutoCAD, and Navisworks are registered trademarks or trademarks of Autodesk, Inc., and/or its subsidiaries and/or affiliates in the USA and/or other countries. All other brand names, product names, or trademarks belong to their respective holders. Autodesk reserves the right to alter product and services offerings, and specifications and pricing at any time without notice, and is not responsible for typographical or graphical errors that may appear in this document.